Thomas Hobbes was the first major thinker to locate an imagined pre-political State of Nature in the Americas. Even his critics such as Locke and Rousseau followed him in seeing native Americans as living in a world which they imagined existed in pre-historic Europe and, most importantly, beyond meaningful dialogue. These and other thinkers used America as a tool through which to think the status of the individual political subject and his relationship with the state. This article argues that indigenous people were much more than rhetorical tools but, rather, were necessary elements for imagining the modern nation state; they were in Shaw’s words, Hobbes’ ‘border guards’ (2008: 38). 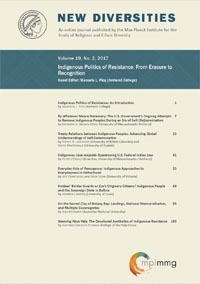 Indigeneity, however, does more than act symbolically as a ‘border guard’ facing the ‘other’ across the parapet of the boundaries of the sovereign state; indigenous people were and are actively challenging those boundaries, shaping its contours, and occasionally breaching the wall altogether.